Wow – October is here already. There is snow up in the north and I hear people getting excited as our favorite time of year is right around the corner. The weekend of January 14th, 2017 is right around the corner too and many are preparing for a great and historic weekend in Port Washington, Wisconsin. First – Banquet prices have been set. If you register/pay for your banquet reservation by November 1st, the cost is only $28/person. After November 1st, the cost will be $35/person. For the 1st 70 reservations, we have for you a $25 Gift Certificate or cool All Balls Racing Metal Sign from All Balls Racing (Winderosa). That’s almost like being able to attend the banquet for FREE or going home with a really neat metal sign to hang in the work shop! Second – If you are interested in a 50th Anniversary Cap, they are $20 if you pre-order and pay or $25 at the banquet. For an additional $5, we will add your name on the temple of the pre-ordered caps. You can pay for your banquet seat and caps by sending me a personal check in USD or I can send you a paypal request that you can pay the fee with a credit card. Third – We need Hus Skis and Diablos of each model! 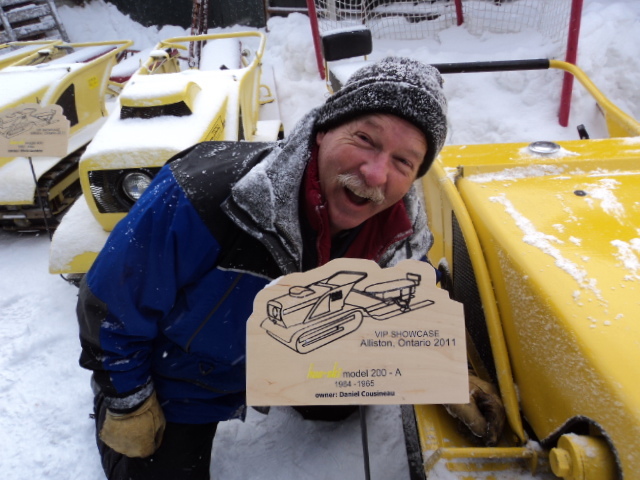 Like we did in Alliston at the Hus Ski 50th Anniversary, we want to show off a good representation of every model and prototype of Hus Ski and Diablo. I need volunteers to put your sled on display at the Saturday event in the park so we can show the world what cool snowmobiles our sleds are. If you have a sled for us to consider, please contact me this month and become an important participant of this historical event. A few rooms are left at the Country Inn and Suites. Making hotel reservations at the Country Inn and Suites in Port Washington is simple. The hotel is offering rooms at significantly reduced rates (double occupancy rates of $79 for a standard room and $99 for a one bedroom parlor suite) . The banquets will be in the Lakeview Conference Center which is at the hotel. When making reservations by calling 1-262-284-2100, request your room be part of the Bolens Diablo Rouge 50th Anniversary block. If you book your rooms in October or tell me directly in October that you are coming to the Diablo Rouge Banquet, I will get you and your guests their allotted “4” Prize Tickets (see past Newsletters if you do not know what I am talking about regarding the Prize Ticket). Please let me know if you have questions. Make your hotel reservations with the Country Inn. I will presume if you are staying at the hotel, you plan to come to the banquet. If you are local to the Port area and not staying at the hotel, make your banquet reservations with me directly. Thank you with all my heart to all those working hard to put together an awesome event and hope to see many of you in Port this January! parts to support enthusiasts like yourself!